This is the first of two submissions to this challenge. I took the liberty of experimenting with a photo editing program to create this effect. 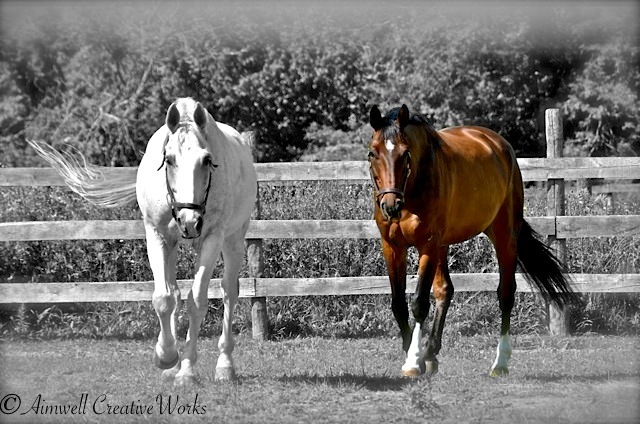 I like how my horse’s bay colouring really pops when juxtaposed to the black and white backdrop. This entry was posted in Animals, Art, Daily Post, Equestrian, Photography, Shout Outs, Uncategorized, Weekly Photo Challenge and tagged Aimwell CreativeWorks, black and white, Daily Prompt, Dorothy Chiotti, Equestrian, Equine image, Horses, Light and shadow, Photography, postaday, summer, Weekly Photo Challenge. Bookmark the permalink. I would hugely appreciate your telling me what software lets you do this. I’ve been trying for this effect on Photoshop and haven’t found a way … I love black and white with one thing in color. You can do some really neat stuff with it. Great! Good idea and well done. The effect is speaking. Thank you. I hoped it would. 🙂 Thanks for stopping by.